The American Academy of Sleep Medicine has designated dental sleep oral appliances as the No. 1 non-surgical alternative for the CPAP intolerant. Although the most successful treatment for Obstructive Sleep Apnea (OSA) is a CPAP (Continuous Positive Airway Pressure), there are numerous difficulties patients are having when trying to use it. People with sleep apnea literally stop breathing repeatedly during their sleep, often for a minute or longer. Perhaps you or your partner suddenly wakes with a startle during the night? Likely this is the body’s reaction to lack of oxygen. If not treated, OSA can take eight to 10 years off someone’s life. OSA can cause driving and work-related accidents, depression, memory loss, impaired concentration, high blood pressure, heart disease, and stroke. More studies are now showing a correlation between sleep apnea and attention deficit disorder (ADD). 60% of all Americans over age 40 snore. 27% of all married couples snore. 50% to 75% of those who try the CPAP reject it. oral appliances to be the most effective in treating snoring and mild to moderate obstructive sleep apnea. If you or someone you know is not getting a good night’s sleep, recommend they see this Dentist in Plano, TX for an evaluation. 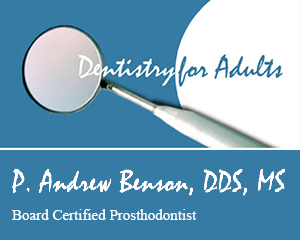 Dr. Andrew Benson will examine and evaluate the patient, and will run a Pulse Oximetery study. Please share this information so your friends and family know there is a non-surgical option to CPAP. Meta:People with sleep apnea literally stop breathing repeatedly, during sleep, often for a minute or longer. If CPAP is not tolerated, call your dentist.